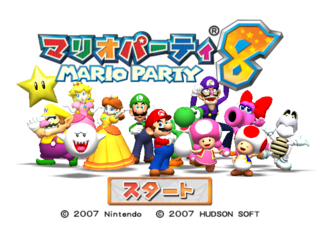 Mario Party 8 is the first Mario Party game for the Wii, and the only one to be developed by Hudson Soft. 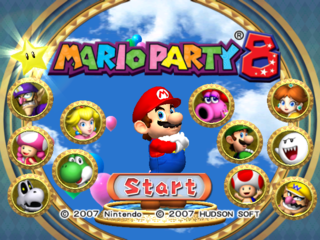 The next Mario Party game for the Wii would come out five years later! The demo is mostly in Japanese, including the Japanese logo. All of the initial playable characters pose on a simple white background. Replace m802.bin (data Folder) and m802dll.rel (dll folder) with selmenu.bin and selmenudll.rel. Start the Swing King mini-game. 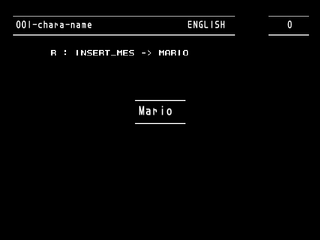 Once the game starts, you should boot into a debug menu. This is the last time this unused font was used by anyone thankfully. Four games later, they're still using the same debug menu. The expected completion date is added and the mini-game titles are changed once more. 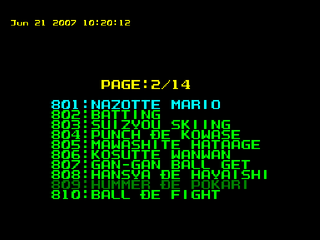 However, this is the final Mario Party where this same debug menu is present. (There is no Page 1 of the debug menu - it skips to 2). 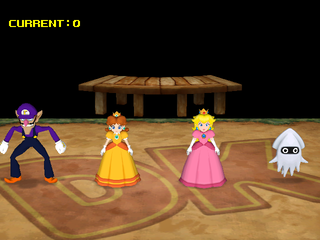 After an absence in Mario Party 7, this pregame character select screen is back! And it is still the same as it was in Mario Party 4! The last option on Page 9 is "MII - GAME SELECT", which leads to a debug sub-menu. 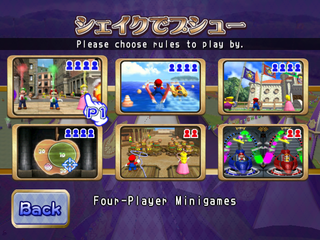 This menu tests mini-games that the Miis can participate in. The only real difference is that the Mii characters are in the character select screen. Press the B Button to return to the main debug menu. Pages 13 and 14 have special options. 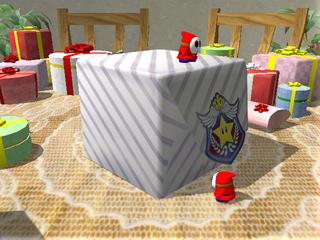 This is the physics / terrain test from Mario Party 7. NOTE: The game assumes that the Wii remote is held sideways. A Button (in air): Ground pound. B Button (in air): Kick. + Button: Exit map (Bugged - ends gameplay but does not exit the map). A test of all of the player characters' animations. 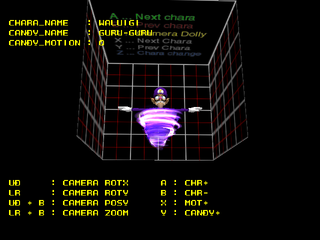 The controls at the top of the cube are not only incorrect, but they still reflect the GameCube control scheme, never represented correctly from Mario Parties 4 through 7! B Button + Left: Zoom camera in. B Button + Right: Zoom camera out. B Button + Up / Down: Move camera up / down. 1 Button: Change quality of character model (0-3, 3 being worst). 2 Button: Load next character. A test of all of the player characters' candy animations. 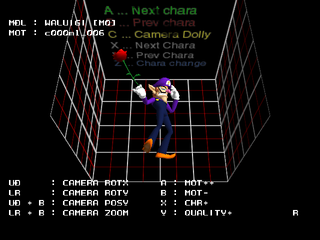 The controls at the top of the cube are actually incorrect and once again, have the GameCube's control scheme. A Button: Load next character. B Button: Load previous character. 1 Button: Change CANDY_MOTION variable (doesn't seem to do anything). 2 Button: Change candy animation. This is a test of every message in the game. Textual excitement! A / 1 Button: Next message. B / 2 Button: Previous message. - Button: Previous message bank. + Button: Next message bank. - Button & + Button: Exit menu. A pretty complex sound debug mode. 2 Button: Play selected sound. + Button: Exit sound test. Up / Down: Choose between sub-menus. Play sounds / music tracks here (provided that their sound group is loaded). Up / Down: Scroll through sounds. A Button: Select a sound. B Button: Go to main menu. Pan: Change sound panning (Positive = Right speaker, Negative = Left speaker). Surround Pan: Change surround sound panning. Pitch: Adjust pitch of sounds / music tracks. Low Pass: Alters the Low-pass filter settings. Reset: Sets all parameters to their default values. Change the 16 global sound variables. Purpose of these variables is currently unknown. Up / Down: Select value. Left / Right: Change value. Adjustments for the game's 3D sound engine. Interior: Adjusts center of sound. Max Volume: Adjust maximum possible value of sound. This is where the different sound groups are loaded. Up / Down: Select sound group. Left: Go to previous page. Right: Go to next page. A Button: Load sound group. - Button: Unload all sound groups. 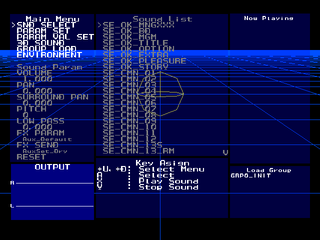 The final sub-menu, adjusts master sound variables. NOTE: Applies to all four controllers. A simple diagnostic test of up to 4 Wii remotes. The + Button exits the menu. Three mini-games are still on the disc, but unused. Their Japanese names are included on the debug menu, but they can't be selected there due to a disabled flag. It's still possible to play them by replacing other mini-games with the unused ones. All of the preview demos for these games have been replaced by copies of Speedy Graffiti's demo. They have no English names and no game explanations of any kind. Replace m801dll.rel (dll folder) with m809dll.rel to replace Speedy Graffiti with this unused 4 player mini-game. 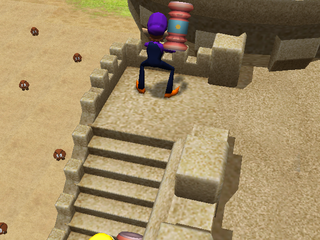 In this game, players must swing the remote horizontally to swing their hammer. The collision detection is a bit off in this mini-game. 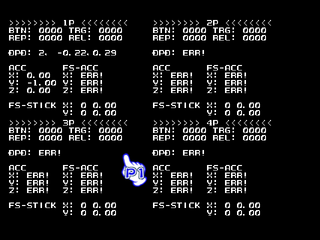 Each player has a displayed coin counter, but in this game's current state it doesn't actually signify anything and doesn't change at all during gameplay without a patched version. https://www.dropbox.com/s/i9kpkhcz5sxab3m/m809DLL.rel?dl=1 is the download to the patched .rel file with a more accurate UI for the NTSC version. The game ends when one player is hit 5 times. The player who got the most hits in wins the game. Replace m815dll.rel with m813DLL.rel to replace Rudder Madness with this unused 4 player mini-game. 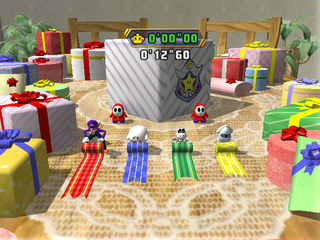 In this mini-game, the players must move their Wii remotes in a clockwise fashion to roll up their ribbons. Whoever rolls theirs up first wins the game, and their ribbon is tied around the top of the giant present. 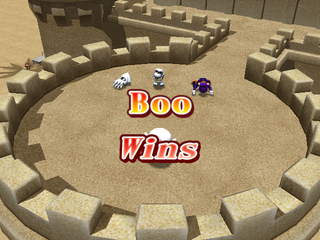 A minigame very similar to this later appeared in Wii Party U. Replace m856dll.rel with m853dll.rel to replace You're the Bob-Omb with this unused Duel mini-game. 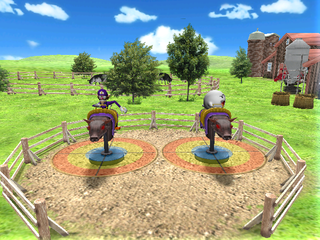 Players must tilt their remotes in the direction of the mechanical bulls or risk flying off. The last person on the bull wins the game. Incidentally, a game with similar rules and controls (but featuring Miis) is found in Wii Party U. If you view the hotel models in a model viewer you will see these unused textures for where the owner icon should be instead of a blank icon. The text translates to "Dummy 1" and "Dummy 3". Add image. There's also an out-of-bounds Goomba and unseen blue curtain in the Fun Bazaar, and more. The garage in Bumper Balloons contains objects such as tires and crates, which are never seen in-game since the garage door never opens. Using the Gecko code 04008524 60000000 in any region of the game will print some information about the current Memory Usage in a box in the upper-left. 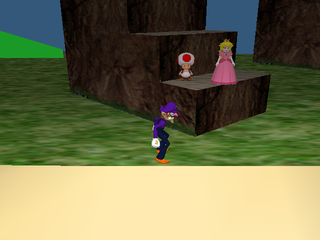 This debugging feature exists in all Hudson Mario Party games as well. Enter the Gecko codes 040111CC 60000000 (PAL) or 0401122C 60000000 (NTSC) and you will see the screen surrounded by red borders which specify the region of the screen that is safe for UI elements to use. The borders specify that within 16 pixels from the horizontal edges and within 40 pixels of the vertical edges are not safe to use. The borders specify that within 48 pixels from the horizontal edges and within 46 pixels of the vertical edges should be treated with caution. Identify the behavior of each version and revision. In some American versions, Kamek says, "Magikoopa magic! Turn the train spastic! Make this ticket tragic!" during Shy Guy's Perplex Express. Since the word "spastic" is offensive in the United Kingdom for being a pejorative term against disabled people, a new version of the game was made, which replaced the word with "erratic". 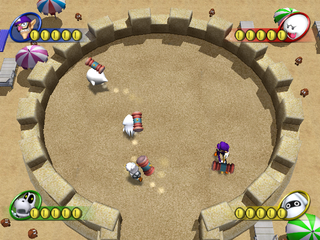 However, some copies of the game were shipped in the United Kingdom with the original dialogue, which caused Nintendo to issue a recall on July 16, 2007. The game was later returned to shelves on August 2, 2007 with all copies having the edited dialogue. All other American versions say "Let me use my magic to make this all a little more interesting!" This incident actually caused enough of a stir to kick off a decade-long trend of Nintendo games featuring completely different localizations for the NTSC and PAL regions, dooming people from one region to have no idea what the other is talking about, and making our jobs a lot more tedious than they need to be. Naughty Kamek! The text font in the UK version was changed and made smaller when compared to the US version. 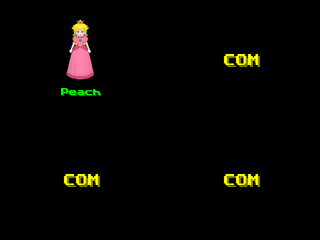 Some versions of the game use a fixed-width dialogue font, others are variable-width. 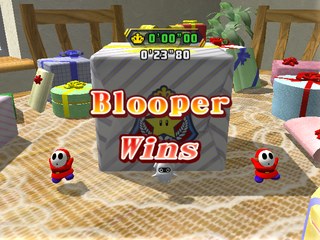 With the Wii set to 16:9, some US and EU versions used a maligned graphical border for 4:3 segments of the game. 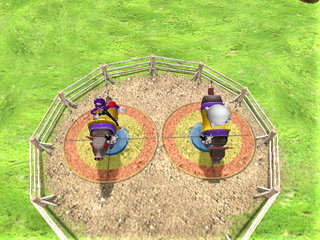 Other versions have standard black bars, since the graphical border was criticized for causing screen burn-in if the game was played for too long. This page was last modified on 11 October 2018, at 17:42.